We are organizing a network mapping workshop at the Radical Networks conference on Oct 21st. Radical Networks is a community conference & arts festival for creative, critical, and alternative applications of Internet technology. 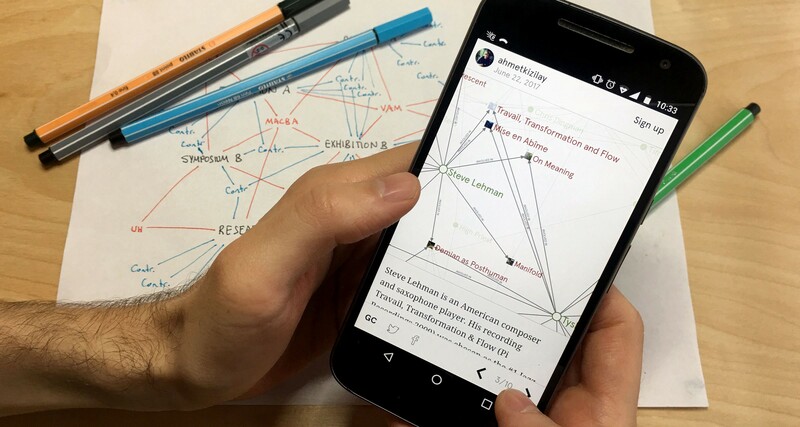 This workshop focuses on the use of complex networks through mapping and analysis in order to expand your thinking about the network as a creative and critical medium. You will start from hands-on drawing exercises and gradually build complex compositions using the Graph Commons platform for collaborative mapping, analyzing, and publishing data-networks. The workshop asks how to extract models from complex systems, how to read those networks with methods such as centrality and cluster analysis, and also includes practice-based work sketching diagrams, editing graph data, and more. As a workshop participant, you will gain creative skills for modeling and analyzing networks, raise new questions and explore answers with your complex data, which would then inform your decisions. This workshop is organized by Burak Arikan & Zeyno Ustun. View the Workshop Archive for past participants’ work. View the Radical Networks conference program. Graph Commons is a collaborative platform for mapping, analyzing and publishing data-networks. It empowers people and organizations to transform their data into interactive maps and untangle complex relations that impact them and their communities. Graph Commons members have been using the platform for data research, investigative journalism, strategizing, organizational analysis, civic activism, archival exploration, and art curating. For any questions or comments contact@graphcommons.com. Follow @graphcommons on Twitter, Graph Commons on Medium, join our chat channel on Slack.